DHI Sprinklers provides sprinkler blow out repairs and services throughout the St. Paul, MN and Twin Cities suburbs. We know that as the temperatures begin to drop and the long Minnesota winter begins, the last thing on your mind is your sprinkler system. Getting a full service sprinkler blow out to winterize your sprinkler system is a key factor for maintenance and longevity of your sprinkler system. If you don’t winterize your sprinkler system, your pipes can crack if water is left in them and it freezes. Your valves and pipe fittings can crack and need repairs or replacement. Some of the most expensive pieces of your sprinkler system can be damaged if you do not properly winterize your system. DHI Sprinklers will winterize your system annually and even set up a recurring appointment, so you don’t have to worry about it! The DHI Sprinklers team has the proper training and tools, including industrial-grade regulators, to blow the remaining water out of your system. A well maintained sprinkler system that has been annually winterized can last 20 years or more with a few minor repairs along the way. Three year guarantee on parts and labor. 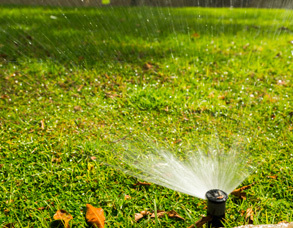 We provide free estimates with the best watering design for your yard. Every detail of the sprinkler installation process is covered, permits, plumbing, electrical. Based on the 5 Star Rating from our customers, you know your new sprinkling system will be on time and within budget.